London is one of the most visited tourist destinations in the World. As a city it welcomes millions of visitors every year. The Underground has a much copied 'Tube Map' and the simplicity of the station signage is legendary. 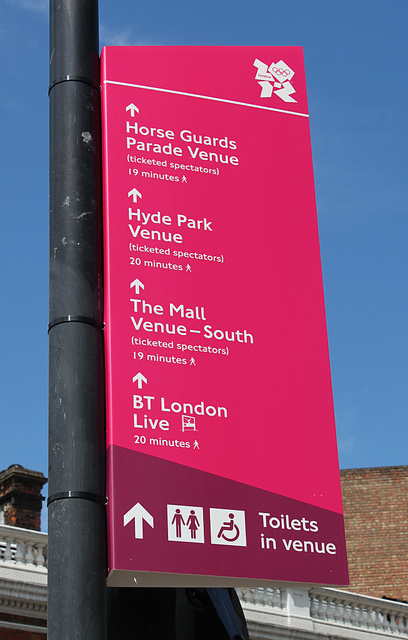 And yet (brilliantly), LOCOG choose to make absolutely certain that everyone could find their venue. 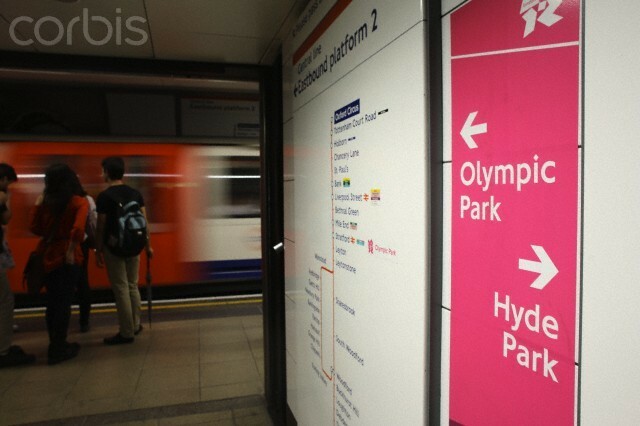 So, they overlaid Olympic venue signage everywhere - on the trains, maps and stations. 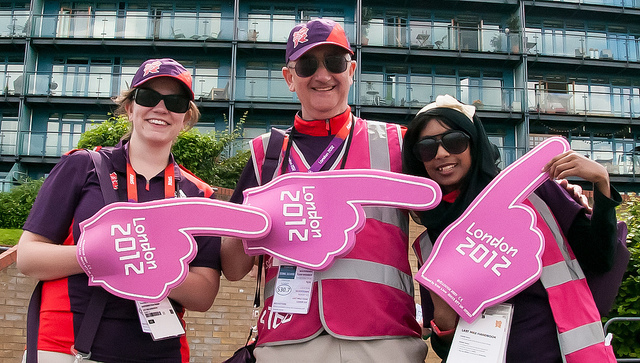 Then, to make absolutely certain that no one got lost, they added human signage in the form of the London Ambassadors. 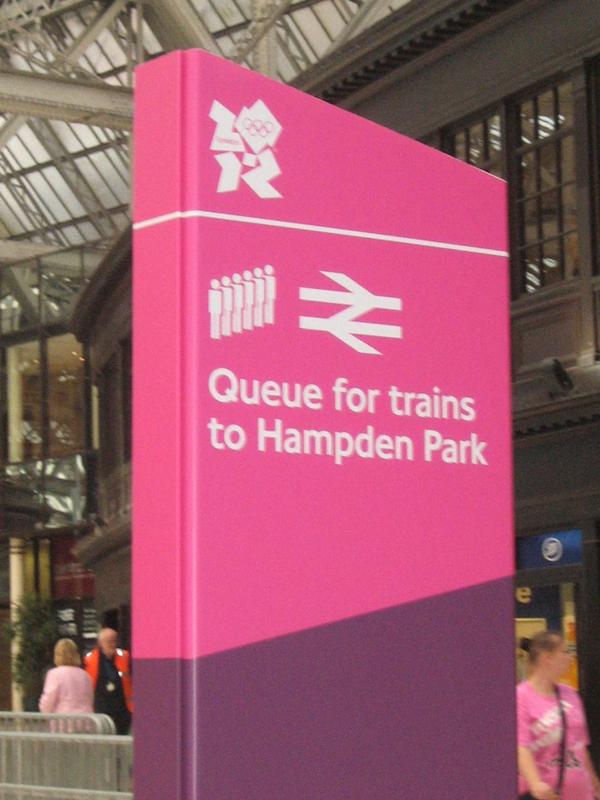 They were brightly dressed in pink and purple and positioned in and around the major transit points - all over London, not just close to the venues, and the airports and train companies changed their service staff hi-vis vests to pink to make them equally identifiable to visitors. At the sporting events themselves, the organisers added 'pre-show' entertainment. 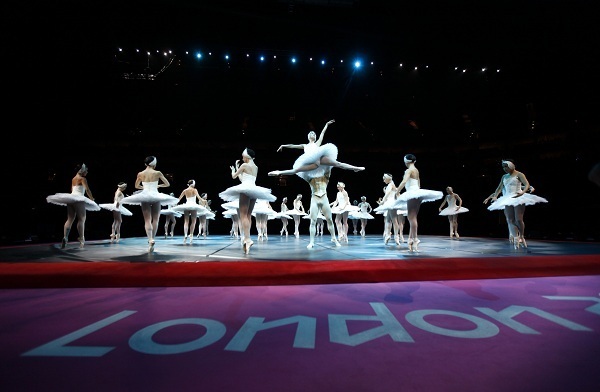 Sometimes simple cheerleaders or dancers, sometimes more specific entertainment; at the gymnastics for example, there was a display by a performance group replicating great gymnastic medal winners from the past on each apparatus, combined with archive TV footage on screens. In addition, at every event, a film was shown explaining the rules of the sport and what to look out for. 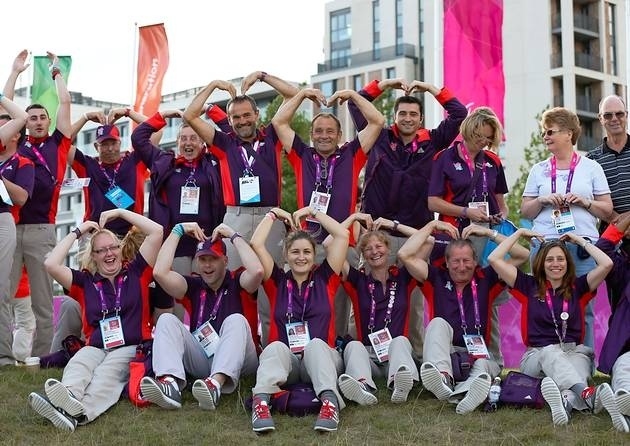 There were 70,000 Gamesmaker volunteers recruited by LOCOG to support the running of the games and an additional 15,000 London Ambassadors recruited by the Mayor of London to provide support around the city itself. What this meant as a visitor to London was a sense of stepping off a train, tube or plane and immediately being welcomed and supported. At every major hub or meeting point there was a volunteer to help - always in good spirit, easily approachable, knowledgable and helpful. The volunteers had been briefed to look out for ways to actively help people. We saw many examples of them taking photographs for families and groups, mostly without being asked. 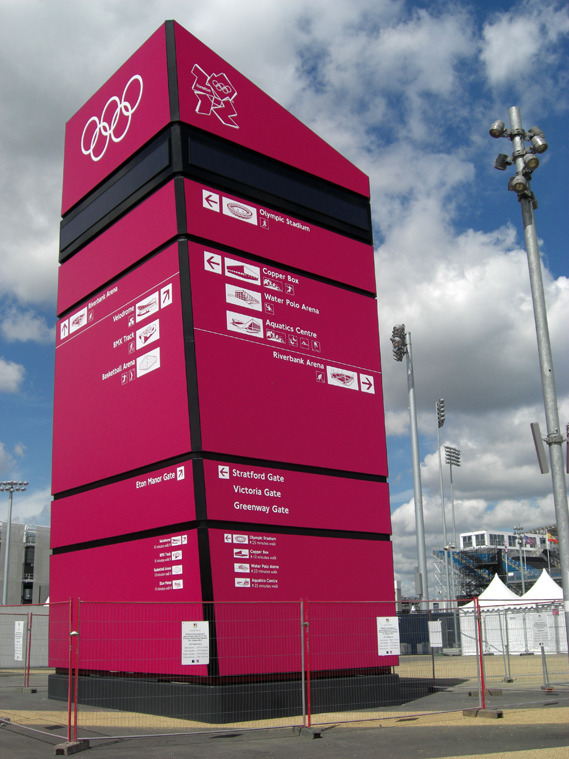 A good sponsorship example at London 2012 was McDonalds. They built an enormous restaurant in the Olympic park which was enlessly busy, at many of the venues there was no actual McDonalds presence beyond branding. They made the most of their sponsorship with their own promotions and advertising. 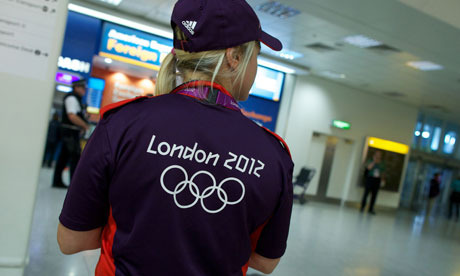 VISA on the other hand insisted that the only payment methods associated with the Olympics would be VISA (apart from cash) - ticket sales, merchandise, food, post-event memorabilia, even cash machines - only VISA accepted. There were a large number of instances of people queueing for a long time for merchandise or food only to find they could pay for it because they had Mastercard or Amex. This blog is typical of the views of people we spoke to. VISA also had corporate hospitality groups supported by temporary 'brand ambassadors' who behaved with supreme arrogance and contempt towards the paying public. Sponsorship has its place and the benefits are huge, but there is a line to be drawn on exclusivity. If the product is the best, people will choose it. A visitor's experience to an event starts with the ticket or invitation and ends when they get home. Everything in between combines to build their event memory, good and bad. Some of it we have control over, some we don't. Toilets have to be clean, session start times considerate,, signage clear and so on; but probably high on most people's list would be food. At the 2012 Olympics all the catering was provided for through the same concessions (with the exception of McDonalds), which sold mostly Coca Cola and Cadbury products along with some staples like pastries or fish and chips. Where existing venues were used, like Old Trafford, Wembley or the O2, the usually food offerings were replaced by the LOCOG offering, even though the usual offering might have variety and substantial food, the LOCOG range would be limited to a sausage roll, Cadburys chocolate and a drink - not as good. On one day we walked from Euston train station to St Pancras train station (a 15 min walk). There were volunteers and signage to direct us initially, then we turned into a long street and started to notice painted footsteps on the floor. 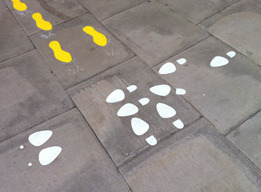 Then another set, a different size foot in a different colour, but following a different pattern. 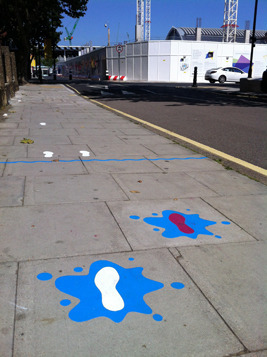 There were a whole sequence of painted footsteps to represent gold medal winning performances by athletes in different sports - there was the water jump from the 3000 steeplechase, a tumble sequence from the gymnastics floor exercise, a judo bout, the triple jump and so on. 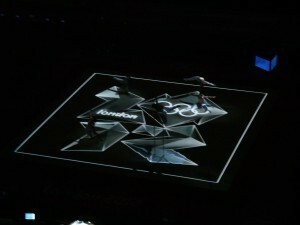 At the end of each sequence there was just the name of the athlete and the year of the performance. You had to work out the sport for yourself. They were fascinating and with beaming smiles, before we knew it we had arrived at St Pancras station (and looking forward to the walk back later). The footsteps were a project by the Stan's Cafe theatre company, more details here. Whatever your opinion of the opening and closing ceremonies, what really mattered was the show, the lights, the music, effects, a story and the element of surprise. You cannot beat a live spectacular.